After making burrata with corn and tomatoes, I just couldn’t throw away the corn cobs without squeezing every sweet drop of summer from them. Since I only had a few, I couldn’t make enough corn stock to be worthwhile for soup. 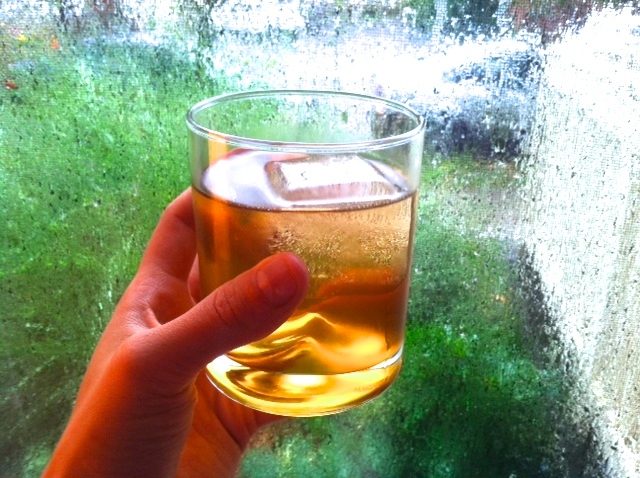 Using the same technique, however, I was able to produce enough sweet corny liquid to create a simple syrup for cocktails. Place corn cobs in a pot and add enough water to cover. Bring to boil, reduce to simmer, and cook to extract flavor, about 30-45 minutes. Strain, and combine however much corn stock you have with equal parts sugar (ex. : 1 cup stock requires 1 cup sugar). Use anywhere you would use standard simple syrup. For me, whisky was a natural partner, so I combined 3 parts of the spirit with 1 part corn simple syrup and topped it with club soda. A great cocktail to help transition into fall. Again, no recipe, just an idea. 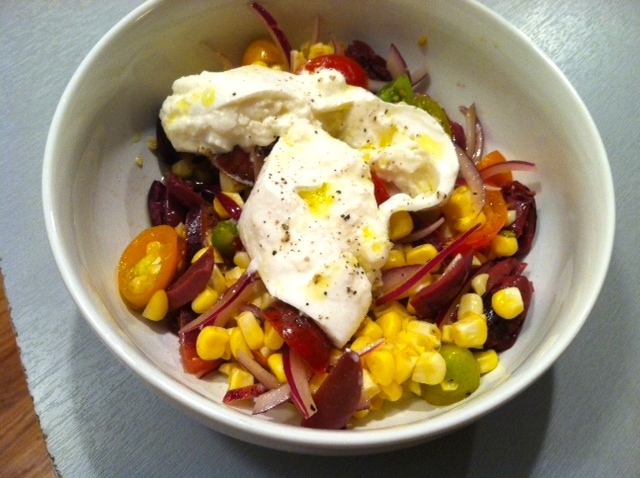 Make a simple salad with all ingredients, minus the burrata, which is served on top. I’m not quite ready to say goodbye to summer, and neither should you. Make this dish as a side, or, better yet, an entree to celebrate this last day of summer. 1. Blanch green beans in salted boiling water until crisp-tender, about 3 minutes. Shock in an ice water bath. 2. 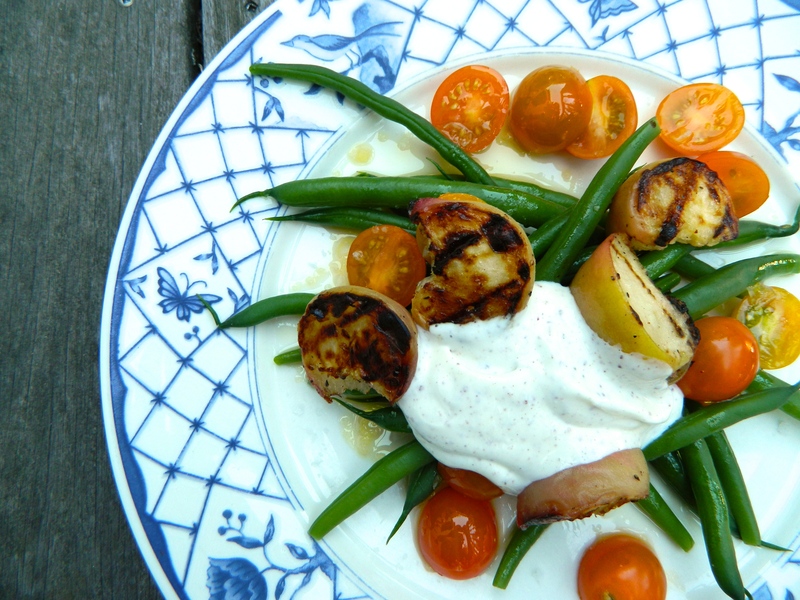 Lightly coat peaches in canola or other neutral oil and grill to desired char. 3. Place green beans on plate or platter and top with peaches and tomatoes; sprinkle with salt and pepper and drizzle with olive oil. 4. Stir together yogurt and sumac, along with salt and pepper to taste. 5. Top salad with a dollop of yogurt. In order for a salad to achieve entree status, it must be exciting, varied in texture, and include higher calorie ingredients to keep me sated (think meat, cheese, nuts, avocado…). 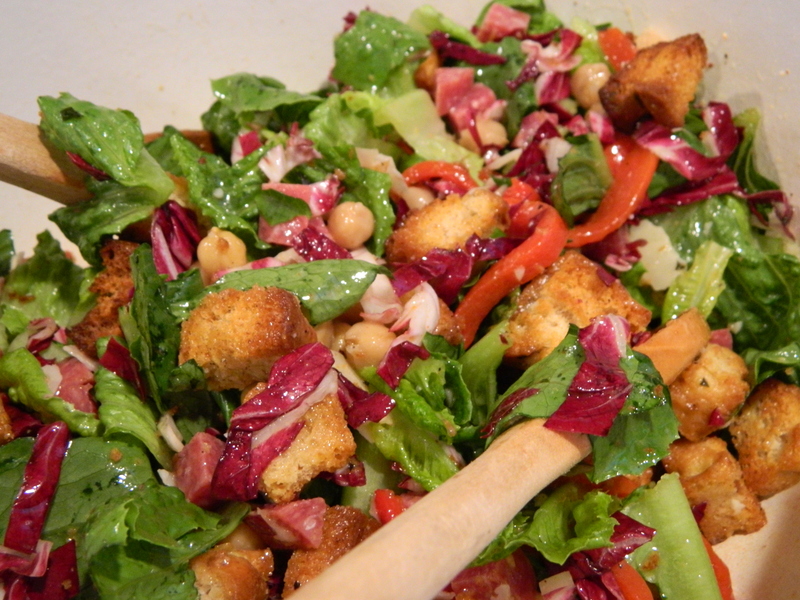 This salad is colorful, crunchy, and doesn’t skimp on flavor. 1. Combine all ingredients in a bowl and toss to coat. This past weekend was the first of football season, and–I can’t believe I’m about to type this–I am so excited for its arrival. In the past few years, I have increasingly looked forward to doing just about nothing on Sundays. These days give me an opportunity to cook (and usually drink) all day; it is on this day I experiment with new dishes, or test popular ones I’ve made in seasons past. One of these recipes is Rice Krispies Treats. I usually keep them traditional, but top them with a spiced chocolate ganache for something a bit more refined. To kickoff the season, this time I stirred in speculoos spread–a flavor that hints at the impending end of summer and transition to the cooler months. So as I prepare to say goodbye to tomatoes, mai tais, and the faint tan I actually achieved this year, I seek solace in Football Sundays. 1. In a large pot, melt butter and add marshmallows. 2. Once marshmallows are melted, stir in speculoos spread and salt. 3. Add cereal and millet and stir until evenly coated with speculoos mixture. 4. Pour into a 13 x 9 x 2-inch greased pan and press down evenly. 5. Let sit for at least 2 hours before cutting. 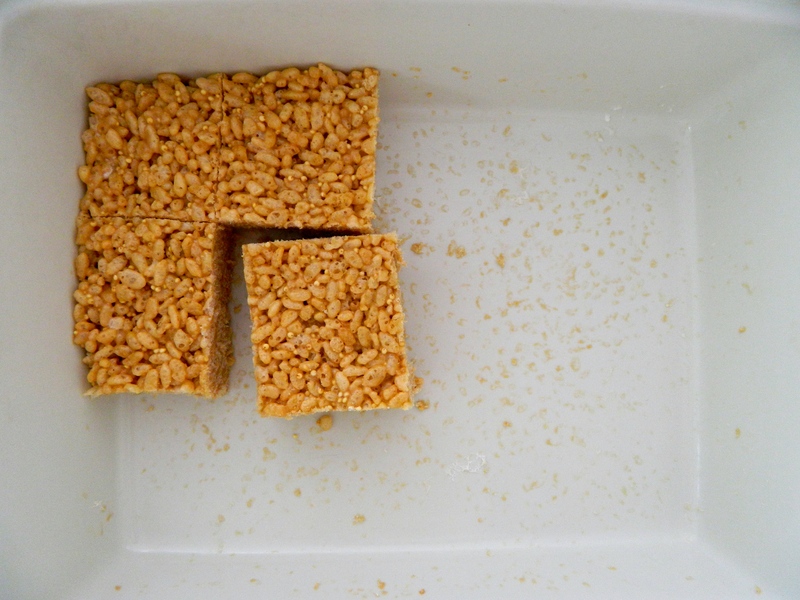 Notes: Of course this is delicious–they’re Rice Krispies Treats, for crying out loud. Speculoos was subtle but prominent enough to make them special. Next time: more millet! For some reason–perhaps it’s the pronounciation–I’ve always shied away from making clafoutis. 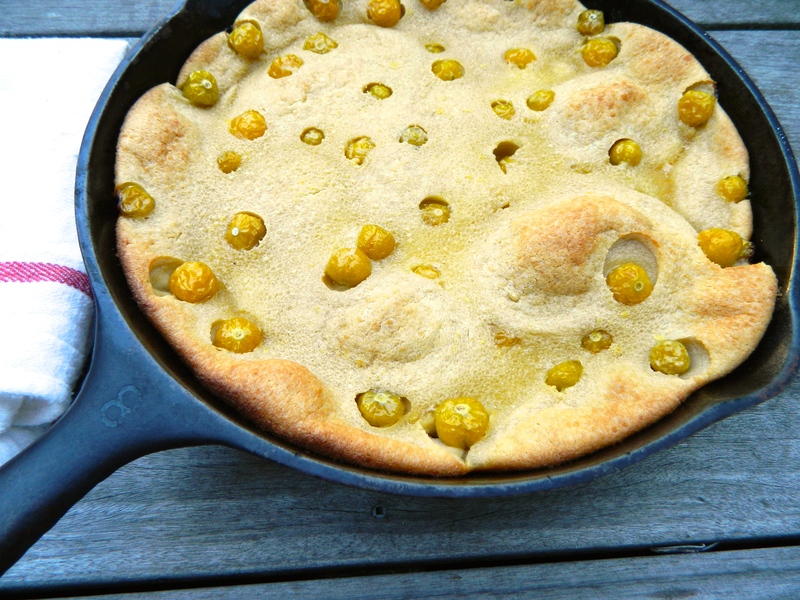 A recent trip to my local farmers’ market compelled me to purchase cape gooseberries, and figured they would be a great stand-in for traditional cherries in this French dessert. The berries are sweet and tart, with a lingering, almost nagging, tomato flavor. I used this recipe from John Besh via Epicurious. The only thing I did differently was add a pint of cape gooseberries. Straight from the oven, the clafoutis is beautiful: puffed like a souffle and a gentle golden brown. In the time it took me to swiftly bring it to the front door for a close-up, it was dead-on-arrival. How did it taste? Kind of like a big, thick crepe, or a sweet, dense pancake. Not bad, but I feel this could use some tweaking in the future, especially since it lends itself to fruits of all seasons. Either way, it was a nice little project that came together quickly and satisfied our inevitable nighttime dessert binge. Next time, this will serve as breakfast in lieu of French toast. This summery dish requires no recipe and demands very little from you. Simply use the freshest, ripest figs you can get your hands on, assemble, and enjoy as a first course or dessert. 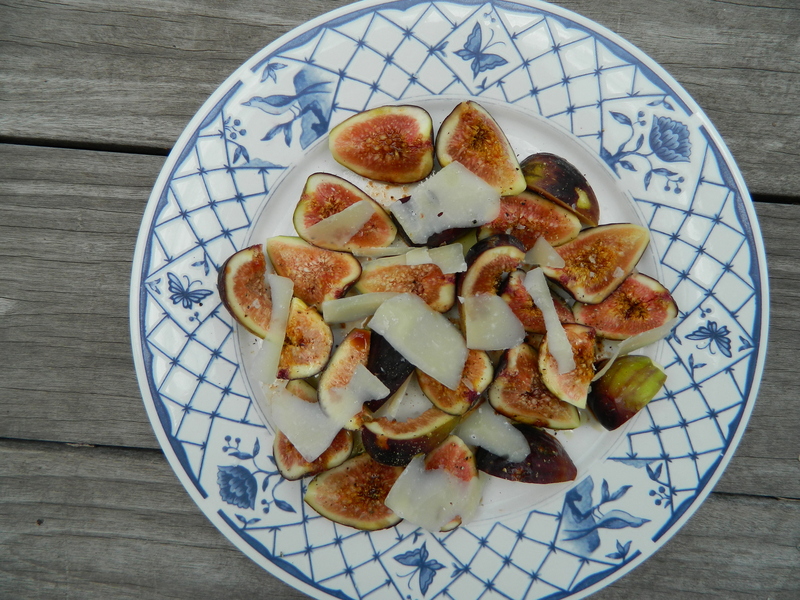 Arrange figs on a plate or platter, drizzle with oil and vinegar, sprinkle with salt and pepper, and top with cheese shavings. Notes: a pop of green would do this dish some good. Think spicy, like arugula, dandelion greens, or watercress. Not too much–just a few leaves scattered on top.